People across the Midwest have been caught having a bit of fun with the sub-zero temperatures brought on by the polar vortex. One Minnesota family took a photo of five pairs of jeans that were frozen outside their home. A martial artist promoted his Martial Arts Academy in Cottage Grove, Minnesota, by play fighting with frozen karate uniforms. 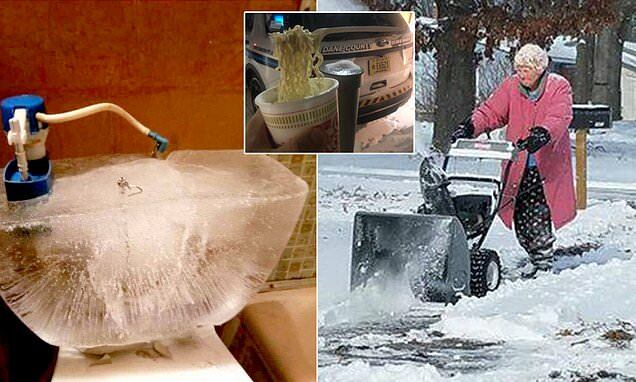 Deputies from the Danes County Sheriff's Office were trying to grab a bite to eat when their Cup of Noodles froze on a fork while they stood outside. One man said it was so cold in his home that the water in his toilet froze. Other quirky photos that were seen across the Midwest, included a woman in Iowa whose wet hair froze when she stepped outside and an 82-year-old grandmother in Michigan who was spotted snowblowing her driveway. Though some people were able to make light of the extreme cold, the polar vortex that paralyzed the Midwest this week was nothing to play around with. At least 13 people were killed in weather-related deaths throughout the week and tens of millions more were left shivering as temperatures plunged to record-breaking lows. The painfully cold weather system that put much of the Midwest into a historic deep freeze lingered on Thursday and continued to break historic records with parts of Illinois and Iowa recording temperatures of -38F and -30F respectively.